PORTLAND, Ore. – January 26, 2018 – Throughout February, USA Pears is celebrating American Heart Month with a variety of engaging promotions to show consumers that pears are a heart-healthy choice. The promotions will place an emphasis on the many nutritional benefits to be gained from making pears a regular part of the diet. With one medium-sized pear providing 6 grams of fiber (24% of daily recommended value), as well as being a good source of vitamin C, pears make for a delicious and nutritious heart-healthy snack. Additionally, Anjou, Bartlett and Bosc pears – all of which are currently in-season – are certified Heart-Healthy by the American Heart Association. 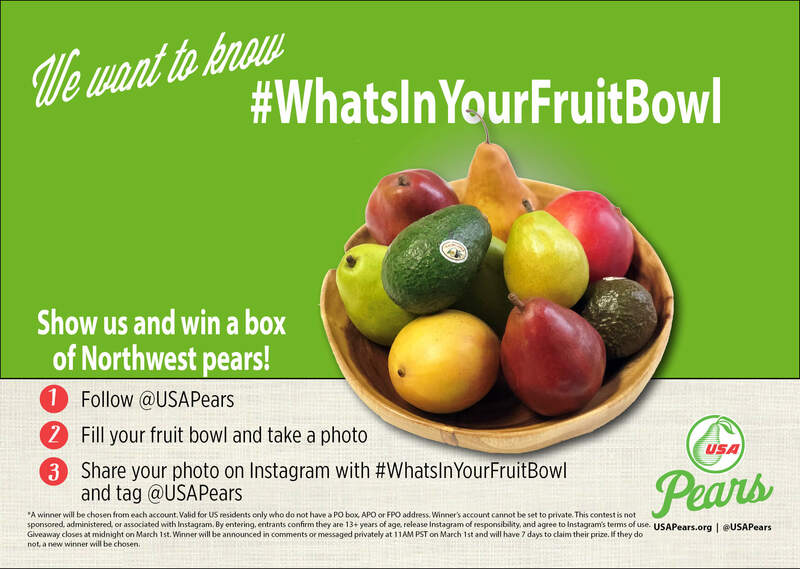 To encourage consumers to keep fruits top-of-mind as a healthy staple, especially during this timely moment, USA Pears is launching the #WhatsInYourFruitBowl social media contest. Kicking off on February 1st and concluding at the end of the month, the contest will take place on Instagram. Participants will be entered to win when they take a picture of their fruit bowl and share it with the #WhatsInYourFruitBowl hashtag. They will also need to follow and tag @USAPears. Shared pictures do not need to contain pears and will be judged on creativity and presentation. On March 1, USA Pears will select one winner, who will be awarded a box of pears and a new fruit bowl. The winning fruit bowl photo will also be shared on the USA Pears social media accounts. 2018 marks the first time USA Pears will be running the #WhatsInYourFruitBowl contest and it is meant to remind households that healthy eating can start with something as simple and ubiquitous as a fruit bowl. Given the recent report from the Center for Disease Control (CDC), which states only 1 in 10 Americans get enough fruits and vegetables, the time is ripe to stock up on some produce. As a way of spreading awareness of the contest and showcasing a united message around eating more fruits and veggies, USA Pears will be partnering with California Avocado Commission and the National Mango Board. To join in on all the fun and ins-pear-ation, make sure to follow @USAPears on Instagram, Facebook and Twitter.